Starborn’s Cap-Tor screws are designed to meet the highest standards for performance, ease of use and value...and they just got even better! Starborn now has colors to perfectly coordinate with your Trex Select decking. Available in #10 x 2-3/4 inch in both the HEADCOTE Cap-tor and DECKFAST Cap-tor. Why We Love It - More color options, you are sure to find the perfect match for your project. 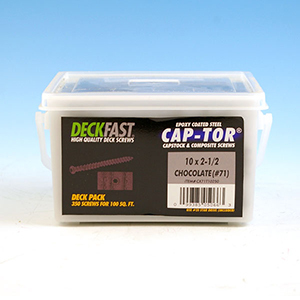 Why It's Unique - Cap-Tor is the only line of deck screws on the market designed specifically for capstock or coextruded decking. Why You'll Love It - There's no need to pre-drill these screws thanks to the Transverse™ threading, auger point and extra deep T-20 star drive.